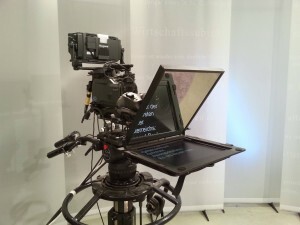 Make your day on set a bit more easy: book your teleprompter and your teleprompter operator here at MGL-Videoservices in Vienna. – A teleprompter helps your host to present long speeches fluently and without the need of learning the text by heart. – It keeps the timetable on track and beware’s the production of bad or not prepared presenters. Videos available in German only! Our equipment is in perfect condition. 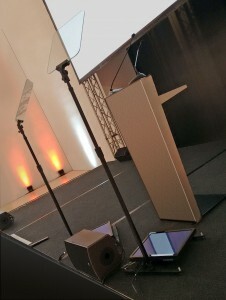 We’ve got three teleprompters for video recording. They have been in use for nearly all Austrian television stations and many independent video production companies from Europe, Canada and the U.S.. Our flexible system works with any camera, from DSLR to big tv camcorders. 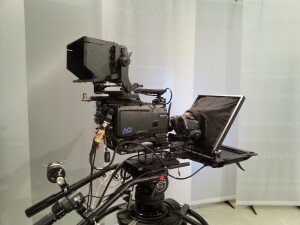 Only the tripod must be able to carry the weight of the camera + the weight of the teleprompter (6kg or 13pounds)! Smaller cameras like DSLR do need some extra weights for counterbalance. Setting up the hardware takes about 1 hour. 1,5 to 2 hours should be planned for a first-time setup. All kinds of text files can be imported and converted. The easiest way during the production workflow is, if the script is prepared as a clean *txt file without any formatting of the text. *… can be used as markers. Jumping from one * to another helps to save time during the production. For example: if you have different topics; set a * at the beginning of each headline. This allows to jump from one headline to another, by pressing only one button! Shorten up „veryloooooongwords“, by adding a „- “ –>>> „verylong- words“. The “ “ splits up the word in a new row if needed. USE BIG LETTERS: for complex words, and write them as you would speak them if the host isn’t familiar with the vocabulary. Please call us, if you have any other questions! It does not include tax and parking fees. Foreign companies: please pay cash at the day of productions. There is a deposit. Id-card or passport required. Transfer Vienna: 35,- (roundtrip), parking is not included. Auf der Suche nach dieser Seite in Deutsch? !